There’s a stark difference between ‘merely’ getting lean and getting shredded. The former can be achieved with hard work, patience and consistency. The latter however requires an almost sadistic mentality to see how far you can push the boundaries and overcome a constant battle in your head that will do everything it can to stop you taking it to the next level. Getting shredded is no easy feat, and isn’t for everyone. In 2017 when I last competed in bodybuilding, I decided to get absolutely shredded to push myself to a level I didn’t think I was capable of. The lessons it taught me transcended bodybuilding, and above all, it made me a far better coach because remember, if you haven’t been to the extreme yourself, how can you take your clients there? While 99% of clients won’t have the desire to get shredded, as a coach it teaches you empathy, how to deal with all the high and lows of aggressive dieting and low body fat, and ultimately, allows you to relate on a deeper level to every stage of your client’s ‘feelings’ during a hard fat loss phase. As a coach residing in Australia, Ivan’s motivation behind his goal wasn’t only to experience being shredded for himself, but to use the lessons as a springboard for his PT career. He wanted to learn empathy and challenge his own standards so he could understand his clients better. This is a hallmark of any good coach, and it’s why at RNT we all hire coaches ourselves. We know the tremendous benefits of having professional accountability, an objective third eye, and an opportunity to always learn more. Being a personal trainer can be a paradox. While incredibly fulfilling, it can also be challenging at times with the unsociable hours, lack of control in your day, and unpredictable income. Which is why Ivan’s biggest win during these 12 weeks wasn’t achieving his life-long goal of being shredded (and recording a 5.9% body fat DEXA scan in the process, see below! ), but it was the new-found ability to pay his mortgage without stress, take back control of his day, and gain financial security. This was unexpected for Ivan. While he’d identified it in himself as a personal struggle, he didn’t think the RNT process would help with this. Which is why in this case study today, we’re going to explore the lifestyle solutions Ivan adopted to get shredded, and the new-found habits and routines that have allowed him to take his career to the next level at the same time. I started with RNT initially to get into the best shape of my life after reading a lot of their content, listening to their podcasts and looking over a lot of their case studies. It was really refreshing and eye opening to see just how hard most of us mere mortals have to really push to get into the condition I imagined. I was very against cardio because I thought I would disintegrate into nothingness, more of a low carbohydrate, higher fat type of guy because carbohydrates are “inflammatory”, and didn’t think calories had to drop too low or even think about doing intermittent fasting as I wanted to preserve as much muscle as I could. Looking back, it was all these preconceived notions that kept me where I was and I needed someone like Nathan to just take the reigns and metaphorically slap me in the face with a dose of reality. I needed to do cardio, I needed to drop calories, I needed to ramp up activity and a higher carbohydrate intake actually suited me so much better (as you will read about later on). – They are a high end product so I need to make enough money to pay for their service. – The cardio, daily steps and training made me structure and organise my day a lot more effectively allowing me to condense all my PT sessions to the morning only while actually increasing revenue due to more people signing up. – Being a client is a fantastic way to understand how your own clients feel and now I treat most of them how my coach treated me. This has only made me better which in turn has lead to more results and referrals. These guys got me into the best shape of my life and they have also made me realise who I truly am throughout the journey. I can never thank them enough because this was truly a huge transformation for me. If you were to look at Ivan’s initial photos, you’d think he was already in good shape, and he wouldn’t need to lose much at all in order to reach his goal of being shredded. He started at a bodyweight of 85.5kg at around 6’1”, and so in accordance with our ‘realistic bodyweight targets’ scale (as outlined in our ‘How Heavy Will You Be When Lean?’ article), he needed to be in the 68 to 80kg range. Despite looking fairly lean, RNT coach Nathan told Ivan he needed to drop 10kg of body fat to get to his goal. His training was a little different to the norm in that it was all gymnastics based with around 60 minutes of skill/strength work and 45 minutes of flexibility work in the day. Ivan had spent years building his foundation with progressive weight training and so was already happy with his level of muscle mass. Which is why he was now exploring new avenues of fitness, and keeping his focus purely on achieving extremely low levels of body fat. The calorie deficit required to drive fat loss can be achieved in one of two ways: less food or more activity. How you choose which side to push on the equation will depend on your lifestyle and preferences. For Ivan over the course of 12 weeks, there were very minimal adjustments to the calories consumed. Instead, he wanted to take advantage of the Australian sun, boost his vitamin D, and incorporate more daily activity outside. This meant pushing steps up to 20,000 a day and adding an hour’s bike ride in the morning. With all this activity in combination with his daily gymnastics training, Ivan’s calories didn’t need to dip below 2000 calories during the process of losing exactly 10kg to get shredded. While this method of dieting may not work for everyone, he loved it. He used his walking as a time for psychological relaxation and self-development, where he’d listen to audiobooks or podcasts. These were some body part photos taken during the process of leaning down. It was this activity advantage that’s allowed Ivan to stay just as shredded ever since completing his dieting phase, which was an important part for him. He’s happy with his level of muscle mass (after spending years developing it), so instead of the typical shift from fat loss to muscle building, Ivan’s goal is to maintain his condition. Now that he’s a couple of months after being at his most shredded, he’s still only a few pounds up. To maintain such level of condition doesn’t happen by accident. It comes through the the stacking of habits, routines and creating non-negotiables into your ‘perfect week’. Ivan loves his hour each of cardio and gymnastics work in the morning, and taking 20,000 steps later throughout the day. These have become non-negotiables for him, and activities he wants to build his perfect week around. They’re not scheduled in to burn body fat, or stay cardiovascular healthy (although that will of course happen), they’re in his diary because he enjoys how it makes him feel. This is a critical part of maintaining your results for the long-term. You absolutely have to make the things you enjoy in the process a critical part of your life, and on a level that’s realistic for you to adhere to on a daily basis. Depending on the context of your goals, you may also need to adopt some of the less enjoyable aspects too, albeit on a smaller scale. A big reason for Ivan opting to take the activity route is his love for food. Through creating such a large void in calories in his day, Ivan’s built back up to maintenance with a clear increase in energy (now up to over 4000 calories and at least 500g carbs a day), and a subsequent improvement in training performance, sleep and mood. He also arguably looks even better now! The middle picture is at the 12 week mark after his dieting phase. The latter is the most recent 6 weeks after with 4000 calories a day. 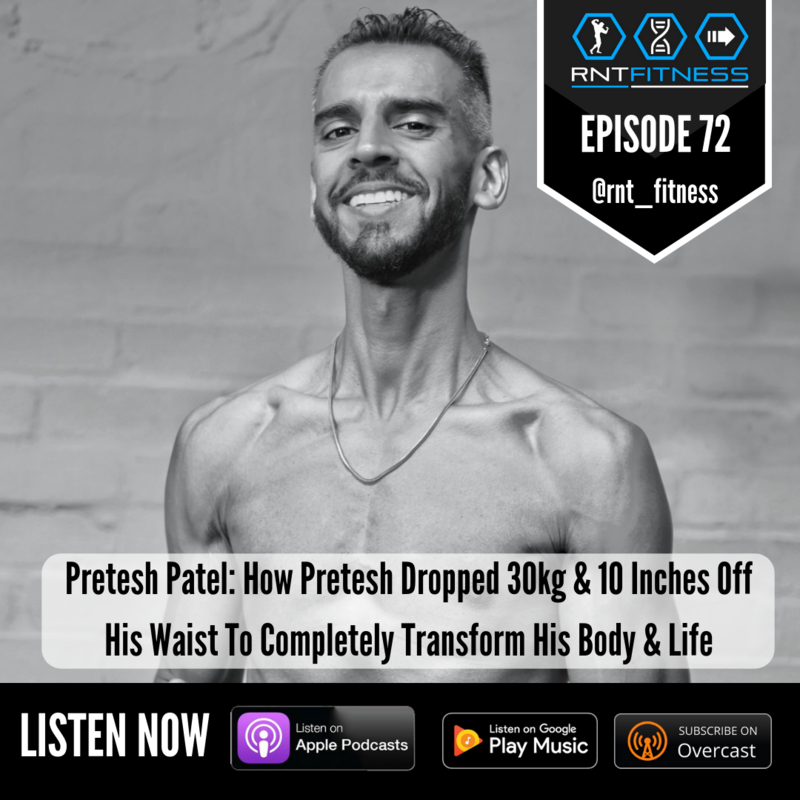 We recently spoke with Ivan on the RNT Fitness Radio podcast, where he talks all about his journey to getting shredded, his motivations, and how it’s allowed him to understand himself on a deeper level. When Ivan came to us at RNT, it was all about achieving a long-term physique goal of getting ‘paper thin skin’ shredded. Through the physical process of getting shredded, his career has been taken to the next level at the same time. I’ve always thought that the process of a transformation transcends the physical, and it’ll be a vehicle to work on the domain in your life that needs the most improvement. What a transformation can do is give you much needed time and energy to focus on yourself, which in turn will lead to growth all over. In Ivan’s case, the non-negotiable lifestyle choices meant he was in control of his time, energy and schedule again. His time spent walking was filled with podcasts, audiobooks and learning materials to be a better coach with his clients. At the same time, the introspection and insights you gain from the journey of getting shredded has heightened his level of empathy and reliability. All these factors combined have cascaded into his career progression, and ultimately his financial security. The number one lesson to learn here is that if you want to achieve and maintain incredible condition, you need to get there in a manner that you can foresee yourself continuing. It needs to be built around habits, routines and non-negotiables. Within each non-negotiable he created for himself, he made it productive, and used it for self-development, learning and professional progression. These habits can be vary from person to person, and will depend on the context of your goals, so it’s important to find what works for you. Ivan’s goals now are to stay in this condition while pursuing his gymnastics goals and achieving the iron cross, which is no small feat! He’s happy with his level of muscle mass, and likes the effect being lean has on his gymnastics, so is driven to stay in shape for this reason too. My name is Ivan and I’m a coach residing in Perth, Australia. I have been extremely passionate about training, nutrition and physique optimisation from a relatively young age which stemmed from a girl saying my arms were small (as most guys can probably relate to!). I was always active from a young age and seemed to have always had certain obsessions that I would completely immerse myself in and disregard everything else. Before starting RNT, I didn’t feel like I was going through any real emotional struggles, but I was always struggling financially. Always struggling to pay bills on time, having little money to spend on myself, etc. Having a mortgage as a personal trainer is not always the most secure thing in the world. Looking back, I just wasn’t being the best coach I could be and was blaming my circumstances more than looking inwardly as to why my client base wasn’t where it should be. This transformation made me so much more organised, pro-active and a much more effective coach which put me in a much more comfortable financial scenario. So even though my journey wasn’t born out of a strong motive to physically change (illness, breaking up with a partner, unhappy with my body) the transformation definitely leaked into other areas of my life, which seems to be a very common thing at RNT! I decided to take action with RNT because I had been following their stuff for a while and a lot of it resonated with myself personally. I have always wanted to be shredded, and I mean disgustingly ‘paper thin skin’ shredded. It has been an obsession of mine for a long time and I felt I was in the right place and life situation to get it done. I know I knew the process on how to do it but I needed the accountability and wanted to take all the thinking out because I knew I would get in my own way when things would get hard. I could see these guys (RNT) were getting people from all works of life into amazing shape, including themselves which was very important to me. They were very liberal with their content, evidence based and most importantly, they got real results with real people and not just the genetically elite. Working with RNT and The Hitman has been the greatest experience I have ever had working with a coach. I have worked with and learnt from many big names that I won’t mention, but all I am going to say is they don’t even come close to the level of attention, detail, accountability and most importantly, the care factor. Nathan seemed to care more about my results than I did and I love how excited he would get with the progress we were making which just made me even more motivated to keep pushing. He also destroyed many preconceived notions I had about getting in TRUE stage lean condition in regards to dropping calories, doing cardio, losing muscle when dieting, cheat meals and diet breaks. It was liberating to put my full trust in him and the process and it had paid off immensely. I can say with 100% confidence that I have finally achieved my goal physique that I want to keep for the rest of my life. I have veins coursing through my abdominals and legs all the time, my face and skin look better than ever and I hit 6.2% body fat on a DEXA. My goal was always to get to stage condition and then maintain it which I know is not sustainable or healthy for a lot of people, especially if you want to grow more muscle over the long term. But the way that Nathan has guided me into this position really makes me believe it is possible. The habits I have learnt over the process have just become part of my normal day to day which I look forward to so much as they fit into my lifestyle perfectly. Cycling has now become a non-negotiable that I do every morning for 1 hour because I love it (not because it burns calories), walking 20,000 steps/day allows me to get a lot of vitamin D and learn through audiobooks and podcasts, time restricted eating allows me to feel like my meals are substantial and having to wait for your first meal makes me appreciate food so much more. Also, due to the nature of my training these days which is all gymnastic and calisthenics based, I can tolerate a much higher training frequency without getting as beat up as someone training with barbells predominantly. I believe all these factors combined have put me in the perfect position to maintain what I have worked so hard for and I can’t praise Nathan and the team at RNT enough. It has truly been a life changing experience and I have never felt more comfortable in my own skin. To read more case studies like Ivan, have a read of the different articles here.